The Atacama desert in South America has been in a super-dry state far longer than any other location on Earth – nearly 40 million years in some places. The Atacama is well known for its lack of rainfall, but scientists are only now getting a handle on how long it has experienced low precipitation levels. Dr Tibor Dunai from Edinburgh, UK, is working in the region to date surfaces. His team reports the existence of hyper-arid conditions in the desert have lasted at least 20 million years. « If you camp there, even after five days, you will notice that there are no flies because there is nothing for them to eat; that’s how dry it is, » Dr Dunai told the BBC. Dr Dunai was speaking here at the American Geophysical Union Fall Meeting. There are locations in the Atacama where not a single drop of rain has been recorded by humans, and the Edinburgh University researcher has studied dry river beds he can show have had no water running through them for 120,000 years. 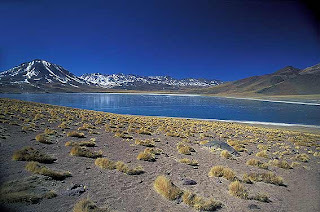 But it is with the general hyper-aridity conditions of the Atacama that the Scottish-based scientist is most interested. Hyper-arid zones can receive some moisture (less than a few tens of millimetres per year), although this can be delivered simply by fogs. His team dates surfaces that would normally be destroyed or washed away by rainfall or running water. This is done with a technique that measures the changes in sediment grains caused by exposure to cosmic rays, high-energy particles bombarding Earth from space. « We found loose sediment surfaces that would be washed away by any desert rainfall and these are older than 20 million years, » he said. This is much older than other hyper-arid regions, such as the Dry Valleys of Antarctica (10-11 million years) and the Namib desert in Africa (5 million years). « The origin of the aridity in the Atacama dates back to the opening of ocean pathways – the opening between South America and Antarctica, and between Australia and the Antarctic. Dr Dunai is now looking into the theory that the dry conditions of the Atacama may have played a role in helping to drive up the Andes. This theory proposes that the paucity of sediments running off the desert region into the ocean is denying lubrication to the Pacific and South American tectonic plates which meet just off the coast. This causes a degree of locking and leads to greater uplift of the Andes than would otherwise be the case. It may also explain why earthquakes in the region can be so large. « Interlocking shear stresses build up so much and if they are released, they produce much stronger earthquakes than are seen in other areas, » Dr Dunai explained.